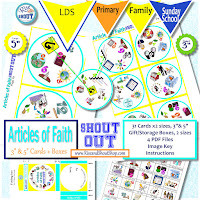 Shout out for the Articles of Faith! They were published 175 years ago on March 1, 1842. The Articles of Faith are 13 declarations of beliefs Joseph Smith wrote in a newspaper to explain the basic tenants of The Church of Jesus Christ of Latter-day Saints. 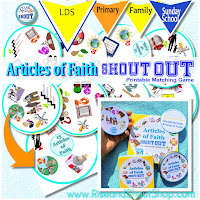 To celebrate this anniversary, I've created Articles of Faith Shout Out. There are 31 images which correspond with different Articles of Faith. For example, a silhouette of a father and son with the number "1" reminds me of the first Article of Faith: "We believe in God the Eternal Father, and in His Son, Jesus Christ, and in the Holy Ghost." 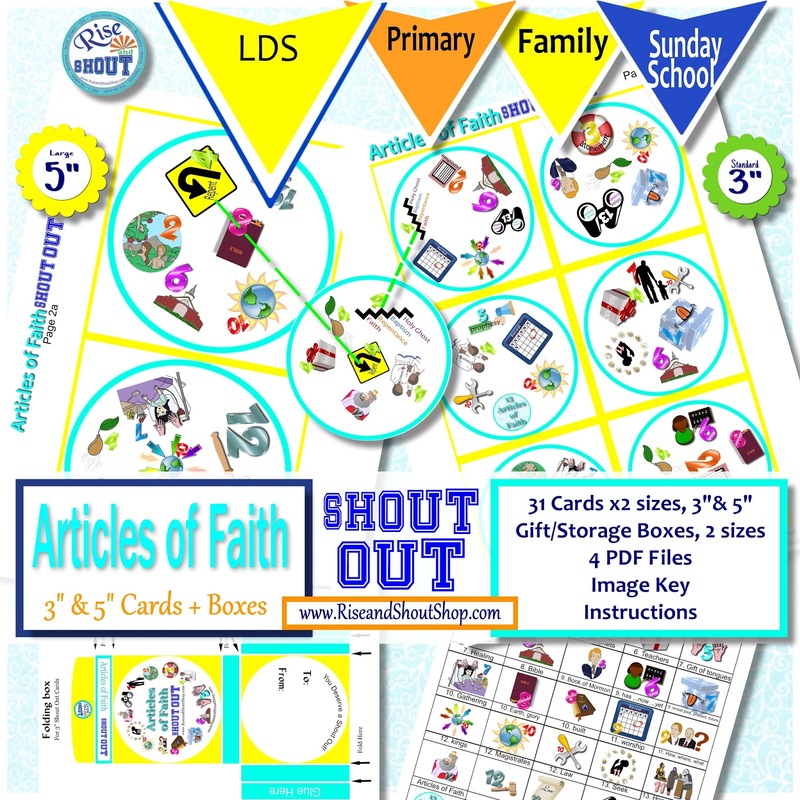 The visual clues for each of the Articles of Faith will help kids remember which is which. To play, each player takes a card and compares their card to the center pile. You race to find the one, ways to play"
and only one match, on your card and Shout Out. The first one to find the match takes the card. Play continues until all the cards are taken. There are also variations to play alone or in large groups (up to 31 players). 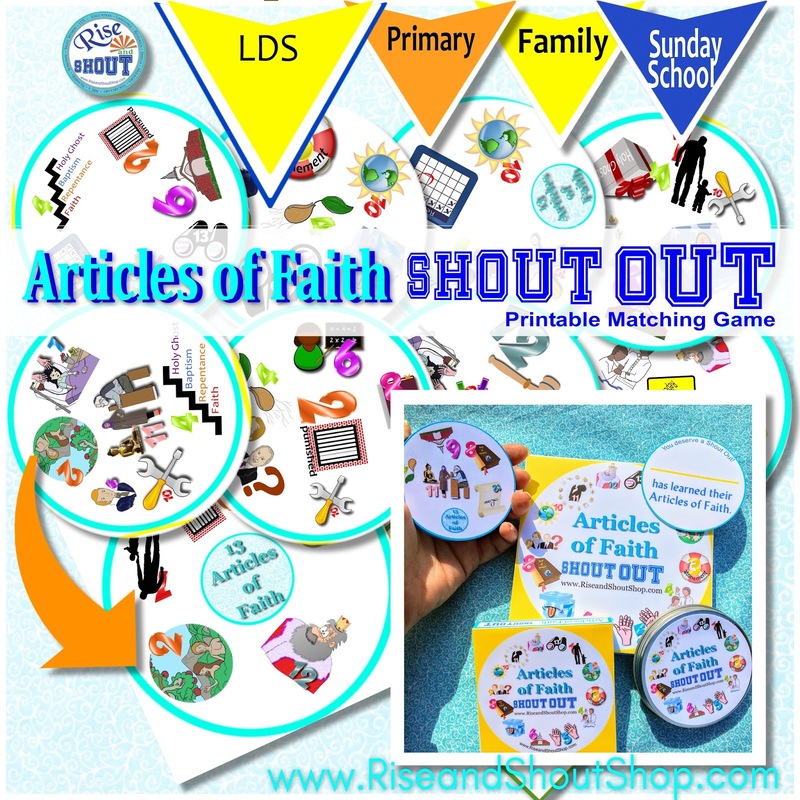 See: "
Shout Out is perfect to play at home during family home evening or on Sundays, or to play at church to introduce the Articles of Faith or to fill remaining lesson time. I'm in charge of Singing Time. I will have an Article of Faith Sunday where I hand out all of the cards. Then I will have the kids compare their card to the person next to them to find the match. We will sing the Article of Faith that is the match. (If you are also in charge of Singing Time, check out Singing Time Shout Out -- it has 31+ no-prep ways to sing and repeat songs. I play about once a month and the kids always beg to play longer.) You can review all of the Articles of Faith at home or church the same way ... whatever match you find, you repeat the Article of Faith. Get a FREE Game: The first 10 people to pin the image above and let me know on social media (Facebook or Instagram) will get a link to a FREE Articles of Faith game. In the comments on Facebook or Instagram, just tell me your Pinterest name and the name of the board you pinned to.